White cotton rags are ideal for a final finish of parquet, wood, or other materials where a rag can not leave streaks or dirt behind. The cotton absorbs glue residue and you can see whether the rag is dirty or not. Our white cotton cleaning rags are available in 10 kilos or 25 kilos. The biggest advantage of white cotton rags is that they do not give off any color and you can easily check whether the clean surface is clean. White cotton rags are often used from a hygienic point of view. When working with solvents, we recommend using white cotton rags, as they will not release any color that may be released by the solvent. Yet another advantage to the white cotton rags is that they can be used several times, so you are also environmentally conscious. 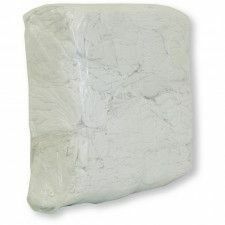 The white cotton rags are also suitable for absorbing grease and moisture, making them well suited for workshops such as garages, fine metal, electronics and more. 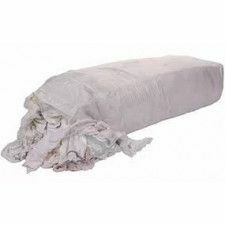 White cotton rags are also extremely suitable for shipping. Cotton is a strong substance. 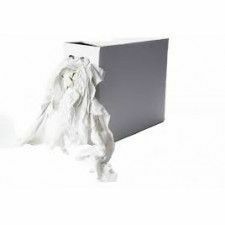 Our white cotton cleaning rags are packed in a dispenser box or in a bag. Available in 10 or 25 kilos. Because the white cotton rags are in a box, the unused rags remain clean. The white cotton cleaning rags are made of clothing that can no longer be worn and are good to use for standard to fine polishing and polishing work. Think of crops and recycled textiles such as cotton shirts. White cotton rags are good for polishing smooth surfaces such as cars or cleaning fine mechanics. But also the final finish of wood or other materials where no streaks or dirt may be left behind are white cotton rags perfect. The cotton absorbs glue residues well.